Ollie is doing really well. He is learning to play nicely with our pug and Sheltie, although every once in a while, he has difficulty sharing our lap. He doesn’t pay any attention to our cats, but they are very used to dogs, so don’t react to him at all. He has been doing great with house training. We only kennel him at night and he has the run of the house during he day. 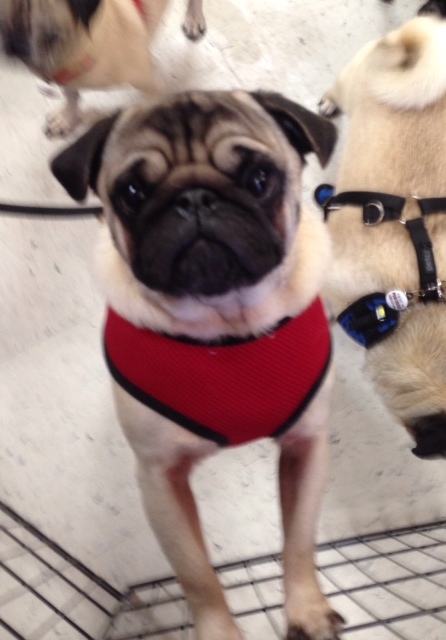 He is a very active pug, very inquisitive an playful. He will cuddle and snuggle, but not until he is done exploring. He truly is a sweet boy, but probably should be an only dog with a family that has time to play, as he needs the activity. He is definitely not a lazy, sleepy dog.